What is SEM? How it Differs from SEO? 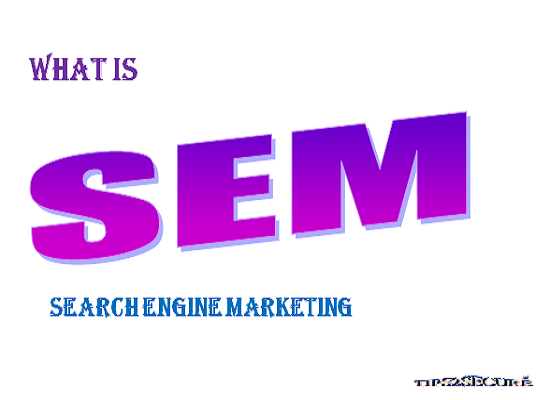 SEM is search engine marketing. Search engine marketing is a strategy that involves the promotion of websites and blogs by increasing their visibility in search engine results pages mainly through paid advertising. We can say that SEO is a component of SEM. We will discuss in detail about these two terms 'SEM' and 'SEO'. After knowing the meaning of SEM, I would like to discuss about the activities involved in Search engine marketing to promote websites and increase their vsibility in search engines. 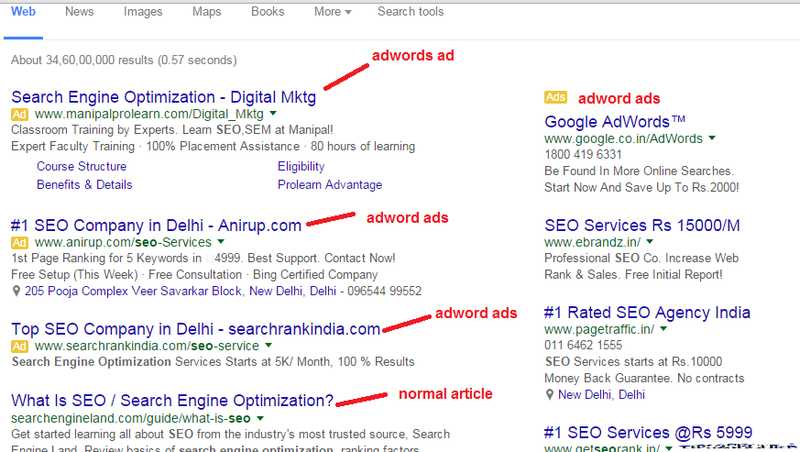 Google Adwords program enables businesses to set a budget for advertising and only pay when people click the ads. 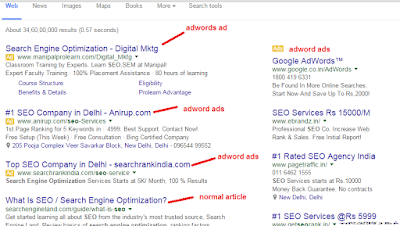 The ad service is largely focused on keywords. When user search for the keywords, sponsored ads are shown at the top. This is also a type of Paid Ads owned by Facebook. Here people buy ads to advertise their business on Facebook by targeting their audiences worldwide. 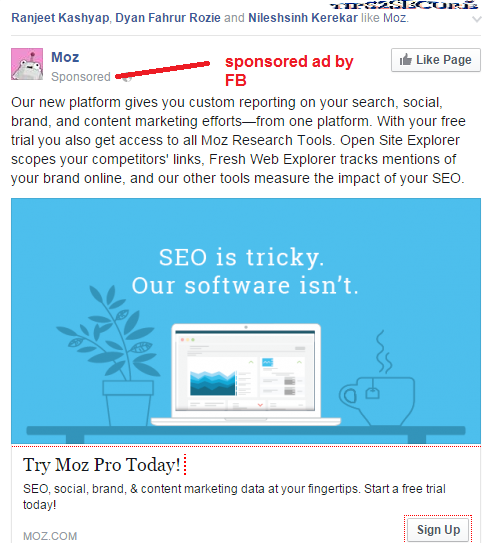 Ads shown on Facebook is looks like as shown in below image. According to Wikipedia, "Bing Ads (formerly Microsoft adCenter and MSN adCenter) is a service that provides pay per click advertising on both the Bing and Yahoo! search engines. As of the fourth quarter 2013, Bing Ads has 15.6% market share in the United States." Campaign managent is also a part of SEM as it takes care about whole campaigns running to improve search engine visibility. Campaign design is also very important to make a campaign successful. Search engine marketing also give focus on campaign design. Search engine optimization (SEO) is the process of affecting the visibility of a website or a web page in a search engine's unpaid results - often referred to as "natural," "organic," or "earned" results. Search engine optimization activities are free at all whereas Search engine marketing services are often paid. To make differences more clear, after writing the activies of SEM, I'm going to write features and activities which are performed in SEO. Generally SEO is divided into two categories, On Page SEO and Off Page SEO. Now let me discuss about On page search engine optimization and then after Off page search engine optimization. On page SEO is all about adding keywords, density of keywords, title, article length, search description, social sharing widgets, internal linking and many more to make the post and blog highly searchable in SERP's. Off page SEO deals in creating good quality backlinks, Social bookmarking, promotional strategies etc. to make the blog rank higher in search engines. I hope this article will make clear you about these two terms, 'SEM' and 'SEO' and also give a clear meaning of search engine marketing. Both SEO and SEM have their signiifcant importance, we can't say anyone is better than other. It depends on blogger or webmasters to select what, SEO or SEM, or both. Message: I hope that you have enjoyed 'What is SEM? How it Differs from SEO?' article. However, if you want me to deliver more items then please share my post. You can use Social Sharing Widget provided at the end of every post. After all, Sharing is Caring! A fantastic blog with a lot of useful information. I would love to get updates from you. Keep blogging. All the best. Afraid OF Buying Backlinks From Fiverr ? Pleasae Try Us We Always Deliver Quality Fiverr Backlinks Or You Will Get Your Money Back Guaranteed. We never recommend users to use services from fiverr to get backlinks. It always be penalized by google. Moreover, it is unethical.